Welcome to Spitting Pig Midlands, my name is Greg and I run the business alongside my wife Edyta. For the last decade we have been serving the areas all around the Midlands and beyond with the finest quality hog roast catering. Over the years our business has gone from strength to strength, and I am very proud at how far my hog roast catering company has come. 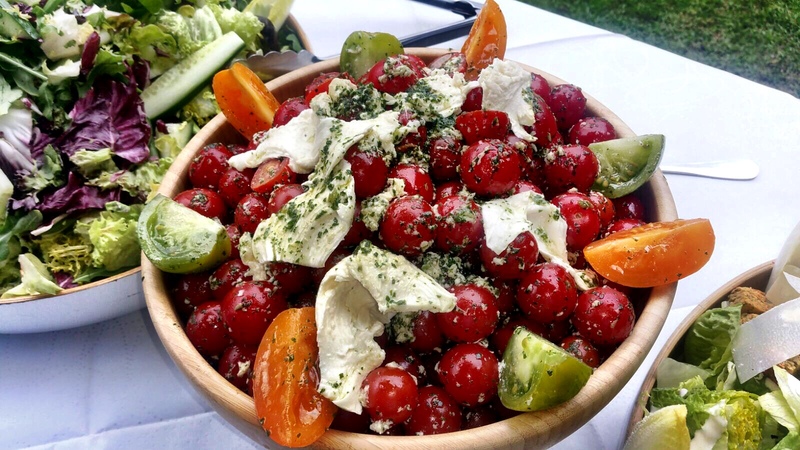 We have driven the company forwards by providing a consistently high standard of food at every event we attend and this has led to many happy customers, recommendations and repeat bookings. It really does make me very happy when I get emails from my customers letting me know how pleased there are with the service we provide. Originally I was looking for something to expand my outside catering business and looked into the idea of hog roasting, after I purchased my first machine my business changed. I started with small scale private parties whilst I researched to learn the trade inside out. 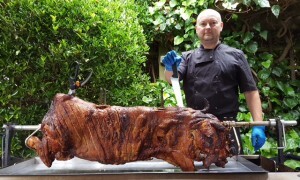 It wasn’t long before I was taking on large corporate events and hog roast Evesham wedding catering. From that day forwards we have never looked back and built up a great reputation for providing first class hog roasts throughout Birmingham from Halesowen, Solihull, Redditch and all the outlying areas. I started off small, in the early days it was just myself and Edyta, providing hog roasts and other catering at small parties and functions, but overtime as our skills grew so did the reputation of our business and we soon found ourselves in great demand. We used the money we earned and invested it in the business by purchasing extra machines, the best equipment on the market. Today the catering company is doing better than ever with a huge base of loyal repeat customers and new clients enquiring all the time. Best of all I truly enjoy my job and look forward to each event, its great to meet all of our customers and watch them enjoy our outstanding Hog Roast Nuneaton food. Our passion for hog roasting really shows through the quality of what we produce and as long as we have happy customers (which we always do) it’s another successful day for us! A hog roast is the centrepiece to your party that you need! Something that can impress your guests both with a visual aspect and the delicious unique flavours created by us. The Nuneaton Hog Roast catering company has grown from strength to strength in the last few years. We began catering for small scale hog roasts whilst we found out feet, though it wasn’t long until we expanded into the larger scale hog roast catering world as more and more people placed orders with us. Initially, Spitting Pig Midlands began life with just myself and my Edyta catering low key functions. 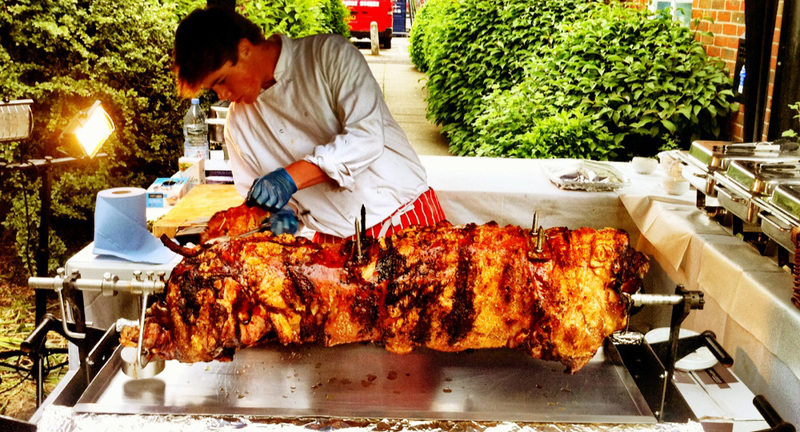 Eventually, our success grew along with our desire to serve the finest hog roasts around, and we started to receive more and more bookings as people began to recognise our talent for catering. Eventually, we had earned enough money through hard work and sheer determination to buy more hog roast machines to expand the company into what it is today. We recruited staff members to work with us. In the end it was only a matter of time until we really took off as a business. After purchasing that first ever hog roast machine, we haven’t looked back and have gone from success to success. All of our energy was focused on Spitting Pig Midlands, that’s why you can be guaranteed the very best when you hire us as your caterers. Having worked in the food industry for a lifetime, we have been there and bought the tee-shirt. As a result we make sure 100% effort and commitment is placed into each and every one of our many bookings. We know you want to enjoy a fabulous event with top catering and a notebook full of memories as a result, and so do we. So dedicated are we to the success of your event that our staff are also prepared to do everything for you, whilst you relax with your guests. Depending on the menu you book with us (see Menu section), we can arrange for one of our specially trained chefs to cook for you and even prepare the food. Alternatively, you can go it alone. We can drop the machine off at your address and collect it when you’re done with it. They’re incredibly simple to use and can be assembled in just ten easy minutes. With our services you have so much variety, with over fifteen menus to choose from. That’s why we’re so renowned in the Midlands and beyond. We’re also well known for using locally reared animals for our hog roasts in Nuneaton, ensuring that all of our customers are getting the very best of British. We can cater for just about any event, big or small. Whether you’re planning a birthday, wedding reception, anniversary, barbecue or business function, look no further than Spitting Pig Midlands. We relish every challenge and rise to every occasion. Please feel free to take a look around the rest of this website to familiarise yourself with our business and find out what we can offer you. If you need any more persuading that we are the right caterers for your event, then read the Testimonials section to see what previous guests thought of our service, or check the Latest News section to stay bang up to date with all of our latest offers. We look forward to seeing you and your guests soon to celebrate your special occasion.